If you get off the bus at Wynyard you can’t but notice some coin being dropped by the Bavarian Beer Cafe on bus shelter advertising. Unlike much of their previous advertising, there’s no cleavage in sight. Bavarian’s gone craft beer on us, and some fair priced lunch specials as well. I do like the burgers. It’s s remarkable tribute to the influence of the craft beer movement that a restaurant chain that has based its value proposition on beer has felt the need to expand its range of malt beverages to include craft beer. As always Brews News gives the detailed low down, but apparently the customers wanted it. I don’t mind the occasional Bavarian Beer Cafe experience. I love a Dunkel and the tasting plate or Schnitzel is a good honest feed. I’d never think to say “hey, love this but you should introduce craft beer”. 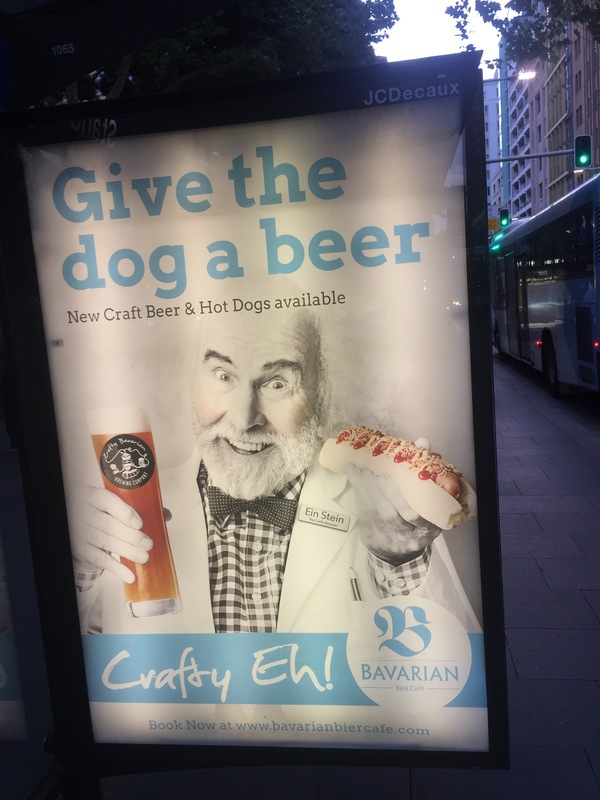 I’m not visiting Bavarian for that. The range is brewed by two contract Brewers in NSW and Victoria, though I’m not sure about the Munich Lager (surely that’s German brewed). 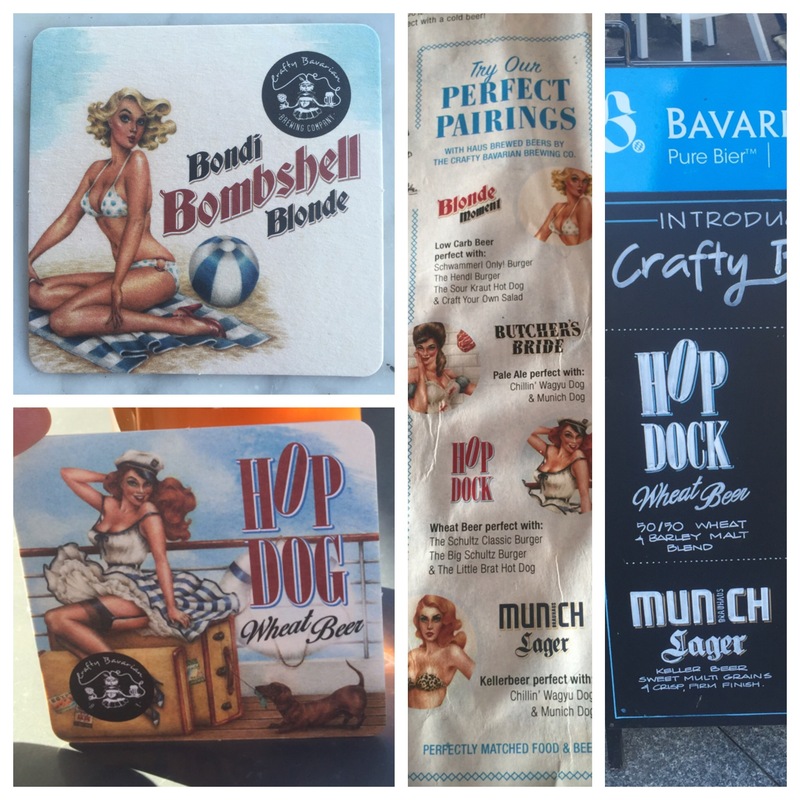 The range is nice and safe – low carb lager (craft?, but I quibble), a pale and a wheat. Modest IBUs and comfortable ABVs. Nothing challenging here, but very drinkable beers. The Tagline is “After 500 years of pure Bavarian brewing traditions, we’ve decided to reinvent craft beer – the Bavarian way. “. Yeah, in Sydney! It must be tough to name beers. With 10s of 1000s of them around, it would be challenging. Crafty Bavarian’s website invites you to “meet the ladies” (aah, there’s the cleavage) – who would seem to have had some name changes very early on. 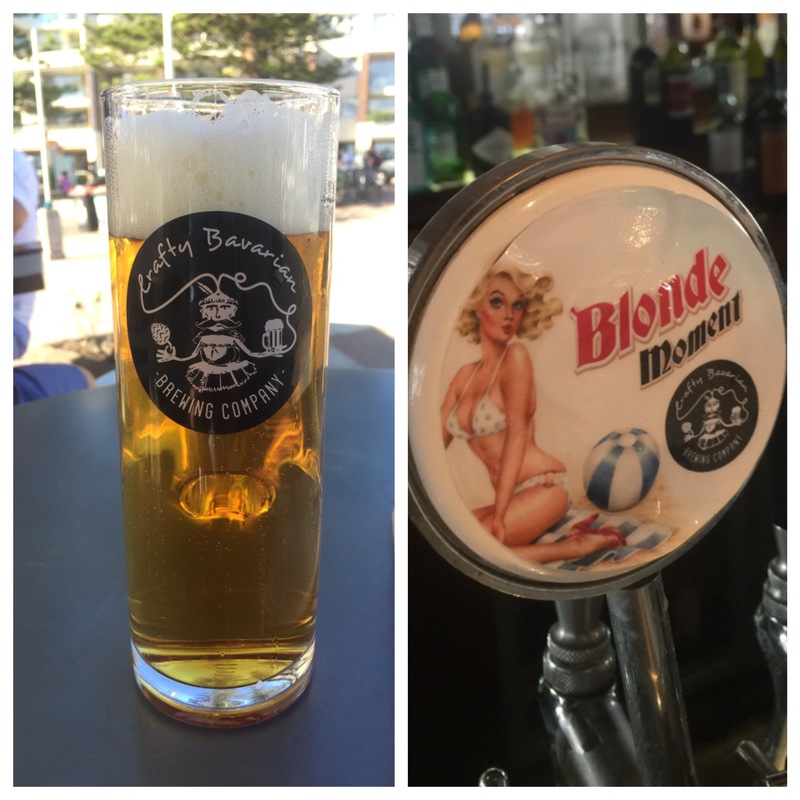 “Bondi Bombshell Blonde” is Blonde Moment and “Hop Dog” has become Hop Dock (huh?). Thanks to BotF UnTappd follower Aaron for pointing out to a rather sleepy correspondent that a certain South Nowra brewer may not have been so pleased about this. I seem to recall a Bondi Beer from a few years ago as well. Well, I’ve got a couple of rare coasters, the majority of which will be in s shredder no doubt.